For speech-language pathologists (SLPs) and early interventionists who are conscientious about using best practices, I’ll admit, this statement may be a tad controversial. Currently, there’s a lot of discussion in our field about this topic. Scroll through any SLP blog, message board or Facebook page and you’ll find it. It’s a question I’m frequently asked in courses and via email from readers at teachmetotalk.com. Traditionally, sign language was utilized primarily for communicating with individuals with hearing loss. In the 1990’s through the early 2000’s, “baby sign” programs began to spring up, and parents everywhere were encouraged to try modified sign language to their infants as a way of encouraging them to communicate before they could speak. The popularity of these programs grew as stories appeared in parenting magazines and on the news. 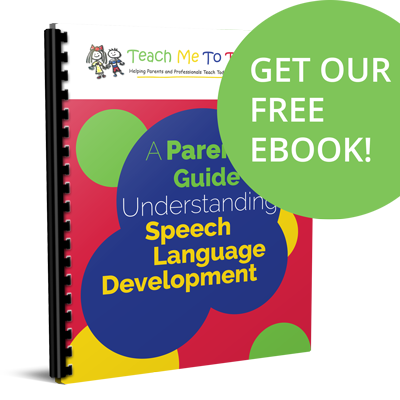 Now, most parents have heard of teaching babies simple signs to use before, and while, they’re learning to talk. Even before these trends emerged in parenting circles, speech-language pathologists were successfully introducing sign language during speech therapy in order to facilitate communication for young children who were having difficulty learning to speak. Teaching methods have evolved over time, and now we have recommendations for how, what, where, and why to teach sign language to a wide variety of infants and toddlers, whether they have difficulty learning to talk or not. 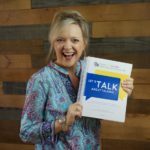 Many speech-language pathologists (like me!) still begin teaching signs with “more,” particularly with toddlers. While I’m asking this question during casual conversation and receiving spontaneous and honest explanations, the responses may not have been considered as deliberately and as clinically as I feel the process should be. I purposefully begin to teach signs with “more.” I’d like to share my carefully weighed reasons for doing so with you. 1. First of all, the sign for “more” is easy! It’s also easy to help a child learn the sign “more” since you can grab his little hands and push his fingers together. 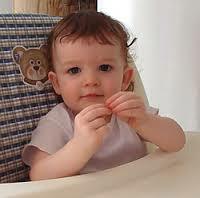 These physical cues, or hands- on assistance, are necessary for many toddlers as they are learning to sign. It is much more difficult to shape little hands when the physical movement is harder. If we are enticing a toddler to learn any new skill, particularly something completely different from what he already knows how to do, we should begin with something that’s not too difficult for him to accomplish. We want SUCCESS! Choosing a sign that’s easy to do and easy to cue (from a motor perspective) makes success more likely. 2. The sign for “more” is FAST! Because the physical movement is so easy, if a child is developmentally ready to use sign language, then you should be able to elicit an attempt for the sign “more” pretty quickly. Anything that’s faster to teach is a natural first goal for a toddler… or anybody else for that matter! Because the sign is easy to perform, it also makes taking turns faster, which is another bonus. We don’t have to wait (and wait and wait) for a child to perform the sign “more” as we might with a more complex motor movement. The turns can move rapidly. Ideally, a child signs “more” and then gets a little more of what he wants. He signs “more” again. He gets a little more. So on and so on and so on until he’s mastered using the sign on his own to get what he wants. 3. The sign for “more” is popular. 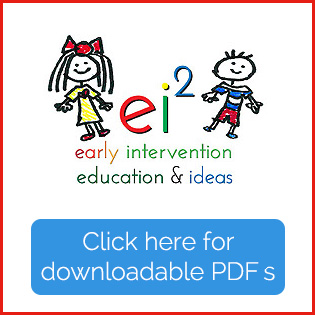 Almost every person who has worked in childcare or educational settings has seen the sign for “more.” As mentioned in the introduction, baby sign programs have popped up all over the place, making signs mainstream for today’s daycare and preschool personnel. Even if a teacher knows only a handful of signs, “more” is usually one of them! 4. The sign “more” is functional. In therapy- speak, functional means learning a skill that enables you to “function” better and more consistently in everyday life. In other words, teaching a child something he can use. The sign for “more” is extremely usable in everyday life, especially for a toddler. Asking for “more” is something all young children do every day, all day! We should give a nonverbal child a way to do this too. The sign for “more” can be used in many contexts for many reasons throughout a toddler’s day. Parents can practice the sign for more ALL THE TIME. That’s why I love this sign! I introduce the sign for “more” for lots of things a child might want – snacks, toys, activities – during therapy sessions. Then I help parents plan specific ideas for how to work the sign into whatever their child likes to do all day long at home with them. Moms and dads can help their child learn the sign for “more” while playing with bubbles in the bathtub, to ask for extra snacks, or to take another turn on the slide or swing. The ample opportunities for practice are what make this sign stick. Again, that’s why I love this sign …and why others hate it. The multiple functions are what enable a child to learn this sign so well – and why a child may get stuck. It’s an adult’s job to move a child along to other signs after learning the sign for “more.” The sign for “more” is the beginning of a child learning to sign, not the end. We can’t let a child get stuck! 6. The word “more” is easy to say. The word “more” is easy to say, especially if we’re considering the simplified versions of “muh” or “mah” we likely hear from new talkers. The ‘m’ sound is made with your lips. Speech-language pathologists call these sounds “bilabials,” and these sounds typically emerge early in babbling and early word attempts. There are always exceptions, particularly with toddlers with atypical speech development, but usually /m/ is easier for a young child to say than words with more difficult consonant sounds such as /s/ or /r/ or /l/. Our ultimate purpose for teaching signs to most late talkers is that signs become a bridge to words. Some studies say that signing can make it easier for some late talkers to begin to speak. Because of this premise, we would want to select signs that represent words that would also be simple for a new talker to try to say. 7. The word “more” is evidence-based. There are studies to support teaching the word “more.” A 2011 study by The Child Study Institute at Bryn Mawr College listed the 25 words that every two year old should know. The word “more” is on this list. To extrapolate these results, if the word “more” is useful for a toddler, then the sign for “more” is too! 8. AAC experts include “more” as a first option for picture systems and with speech-generating devices too. AAC means “augmentative alternative communication” – basically, using anything besides talking as a means to communicate. Experts in AAC include “more” represented by a pictured symbol to teach a person to request with his or her system. Why stray away from this standard when teaching signs, another form of AAC, for toddlers? 9. Asking for “more” is an early form of requesting, and requesting is one of the earliest pragmatic functions to develop. “Pragmatics” means language use. We have to teach a child to “use” words and signs to communicate with other people, not just to name or label things and people. One of the earliest ways a child learns to communicate with others is to use words is to ask for things he wants and cannot get on his own. When a child learns to use the sign for “more” to request, his communication skills are advancing. Signing is more complex and more purposeful than other less-mature forms of requesting, such as when a younger baby uses crying or reaching. 10. I’ve seen success with this sign… for over 20 years now! In my own career, I’ve taught late-talking toddlers, even those with significant developmental challenges, to use the sign for “more” hundreds and hundreds and hundreds of times. In my own personal experience, it’s a sign that WORKS, especially to get signing started. Let me also address the issue of overgeneralizing head-on with something we know to be true: overgeneralizing is very common in language development. Many babies call every man they see “Dada,” every round object “ball,” and all four legged animals “doggie,” until we teach them new words. The same holds true for the word or sign “more.” A child will overuse this sign until we teach him to replace it with new signs. It is important to note that the sign for “more,” and all other signs for that matter, only works when signing is an appropriate strategy for a toddler who is struggling to learn to communicate. Signing doesn’t work for every child with language delays. Look for an upcoming post that includes studies that tell us when signing may not work, along with practical ways I use to gauge whether a child is developmentally ready to sign.